The Palais-Royal, originally called the Palais-Cardinal, is a former royal palace located in the 1st arrondissement of Paris, France. The screened entrance court faces the Place du Palais-Royal, opposite the Louvre. 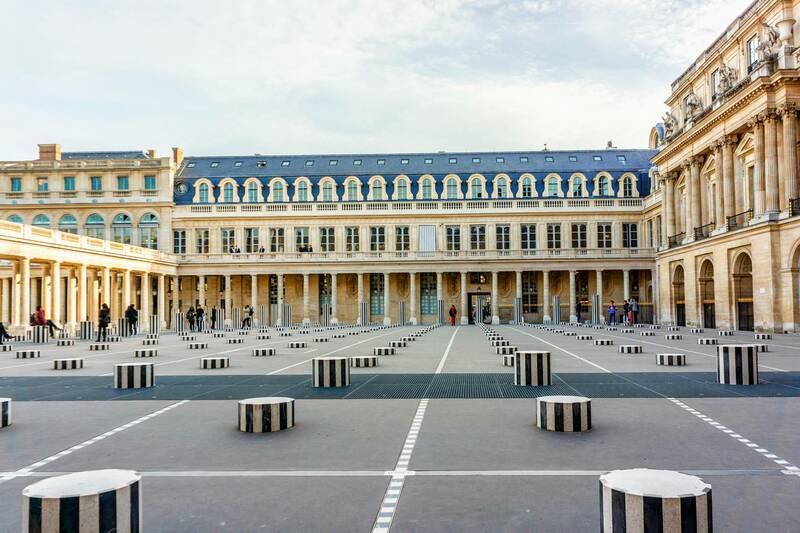 The larger inner courtyard, the Cour d'Honneur, has since 1986 contained Daniel Buren's site-specific art piece Les Deux Plateaux, known as Les Colonnes de Buren. In 1830 the Cour d'Honneur was enclosed to the north by what was probably the most famous of Paris's covered arcades, the Galerie d'Orléans. Demolished in the 1930s, its flanking rows of columns still stand between the Cour d'Honneur and the popular Palais-Royal Gardens. The Palais-Royal is nowadays the seat of the Ministry of Culture and the Constitutional Council. Originally called the Palais-Cardinal, the palace was the personal residence of Cardinal Richelieu. The architect Jacques Lemercier began his design in 1629; construction commenced in 1633 and was completed in 1639. 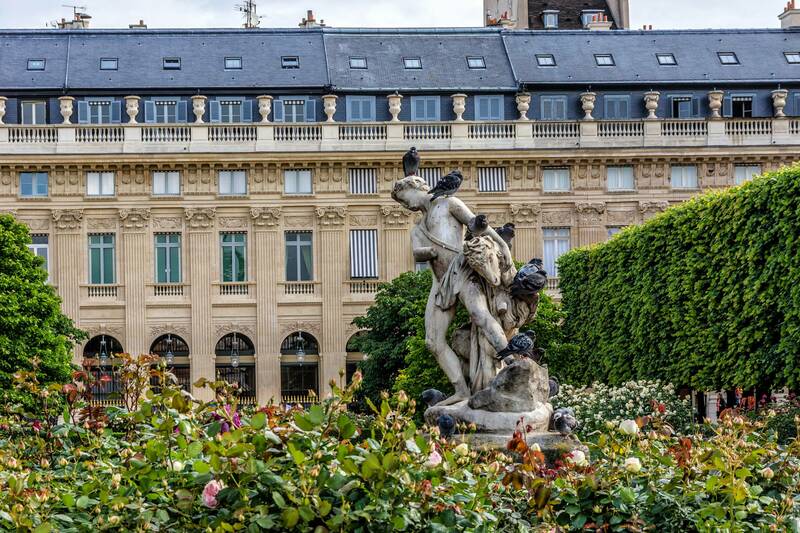 Upon Richelieu's death in 1642 the palace became the property of the King and acquired the new name Palais-Royal. After Louis XIII died the following year, it became the home of the Queen Mother Anne of Austria and her young sons Louis XIV and Philippe, duc d'Anjou, along with her advisor Cardinal Mazarin. From 1649, the palace was the residence of the exiled Henrietta Maria and Henrietta Anne Stuart, wife and daughter of the deposed King Charles I of England. The two had escaped England in the midst of the English Civil War and were sheltered by Henrietta Maria's nephew, King Louis XIV. Henrietta Anne was later married to Louis' younger brother, Philippe de France, duc d'Orléans in the palace chapel on 31 March 1661. The following year the new duchesse d'Orléans gave birth to a daughter, Marie Louise d'Orléans, inside the palace. After their marriage, the palace became the main residence of the House of Orléans. The Duchess created the ornamental gardens of the palace, which were said to be among the most beautiful in Paris. Under the new ducal couple, the Palais-Royal would become the social center of the capital. The court gatherings at the Palais-Royal were famed all around the capital as well as all of France. It was at these parties that the crème de la crème of French society came to see and be seen. Guests included the main members of the royal family like the Queen Mother, Anne of Austria; the duchesse de Montpensier, the Princes de Condé and de Conti. Philippe's favourites were also frequent visitors. The palace was redecorated and new apartments were created for the Duchess's maids and staff. Several of the women who later came to be favourites to King Louis XIV were from her household: Louise de La Vallière, who gave birth there to two sons of the kings, in 1663 and 1665; Françoise-Athénaïs, marquise de Montespan, who supplanted Louise; and Angélique de Fontanges, who was in service to the second Duchess of Orléans. After Henrietta Anne died in 1670 the Duke took a second wife, the Princess Palatine, who preferred to live in the Château de Saint-Cloud. Saint-Cloud thus became the main residence of her eldest son and the heir to the House of Orléans, Philippe Charles d'Orléans known as the duc de Chartres. In 1692, on the occasion of the marriage of the duc de Chartres to Françoise Marie de Bourbon, Mademoiselle de Blois, a legitimised daughter of Louis XIV and Madame de Montespan, the King deeded the Palais-Royal to his brother. For the convenience of the bride, new apartments were built and furnished in the wing facing east on the rue de Richelieu. It was at this time that Philippe commissioned the gallery for his famous Orleans Collection of paintings, which was easily accessible to the public. The architect was Jules Hardouin-Mansart, and the cost of this reconstruction was totaled to be 400,000 livres. Hardouin-Mansart's assistant, François d'Orbay, prepared a general site plan, showing the Palais-Royal before these alterations were made. The garden shown on the plan was designed by André Lenôtre. After the dismissal of Madame de Montespan and the arrival of her successor, Madame de Maintenon, who forbade any lavish entertainment at Versailles, the Palais-Royal was again a social highlight. When the Duke of Orléans died in 1701, his son became the head of the House of Orléans. The new Duke and Duchess of Orléans took up residence at the Palais-Royal. Two of their daughters, Charlotte Aglaé d'Orléans, later the Duchess of Modena, and Louise Diane d'Orléans, later the Princess of Conti, were born there. Over a decade or so, sections of the Palais were transformed into shopping arcades that became the centre of 18th-century Parisian social, economic and social life. Inspired by the souks of Arabia, the Galerie de Bois, a series of wooden shops linking the ends of the Palais Royal, was first opened in 1786. For Parisians, who lived in the virtual absence of pavements, the streets were dangerous and dirty; the arcade was a welcome addition to the streetscape as it afforded a safe place where Parisians could window shop and socialise. Thus, the Palais-Royal began what the architect, Bertrand Lemoine, describes as l’Ère des passages couverts (the Arcade Era), which transformed European shopping habits between 1786 and 1935. Designed to attract the genteel middle class, the Palais-Royal sold luxury goods at relatively high prices. However, prices were never a deterrent, as these new arcades came to be the place to shop and to be seen. Arcades offered shoppers the promise of an enclosed space away from the chaos that characterised the noisy, dirty streets; a warm, dry space away from the elements; and a safe-haven where people could socialise and spend their leisure time. Promenading in the arcades became a popular eighteenth century pastime for the emerging middle classes. Within a decade, new arcades were opened at the Palais site, and it was transformed into a complex of gardens, shops and entertainment venues situated on the external perimeter of the grounds, under the original colonnades. The area boasted some 145 boutiques, cafés, salons, hair salons, bookshops, museums, and numerous refreshment kiosks as well as two theatres. The retail outlets specialised in luxury goods such as fine jewellery, furs, paintings and furniture designed to appeal to the wealthy elite. Retailers operating out of the Palais complex were among the first in Europe to adopt fixed prices and thereby spare their clients the hassle of bartering. Stores were fitted with long glass exterior windows (at the time shop glazing was virtually unknown in Paris), which allowed the emerging middle classes to window shop and indulge in fantasies, even when they may not have been able to afford the high retail prices. Thus, the Palais-Royal became one of the first examples of a new style of shopping arcade, frequented by both the aristocracy and the middle classes. By day the galleries, bookshops, salons, cafés, and restaurants were an important gathering place for the aristocracy, intellectuals, students and financiers. By night, it became the haunt of libertines, off-duty soldiers and prostitutes, many of whom rented apartments in the building. In addition, charlatans, gambling houses, ventriloquists, pimps, and prostitutes held court on the doorstep of the royal palace. Above all, it developed a reputation as being a site of sophisticated conversation, revolving around the salons, cafés, and bookshops, and the centre of Parisian social life. Today the Palais-Royal houses the Conseil d'État, the Constitutional Council, and the Ministry of Culture. At the rear of the garden are the older buildings of the Bibliothèque nationale de France, the national library of deposit, with a collection of more than 30,000,000 items (14 million books and publications); most of the collections have been moved to more modern settings elsewhere. The House of Orléans did not occupy the northeast wing, where Anne of Austria had originally lived, but instead chose to reside in the palais Brion to the west of the main block, where the future regent, before his father died, commissioned Gilles-Marie Oppenord to decorate the grand appartement in the light and lively style Régence that foreshadowed the Rococo. These, and the Regent's more intimate petits appartements, as well as a gallery painted with Virgilian subjects by Coypel, were all demolished in 1784, for the installation of the Théâtre-Français, now the Comédie-Française. The palais Brion, a separate pavilion standing along rue Richelieu, to the west of the Palais-Royal, had been purchased by Louis XIV from the heirs of Cardinal Richelieu. Louis had it connected to the Palais-Royal. It was at the palais Brion that Louis had his mistress Louise de La Vallière stay while his affair with Madame de Montespan was still an official secret. Later on, the royal collection of antiquities was installed at the palais Brion, under the care of the art critic and official court historian André Félibien, who had been appointed in 1673.